A Sunday Times columnist "will not write again" for the newspaper after one of his articles was branded "anti-Semitic" and "disgraceful". In the piece, Kevin Myers suggested BBC presenters Claudia Winkleman and Vanessa Feltz earned high salaries because they were Jewish. Editor Martin Ivens said the piece, which appeared in the Irish edition and online, should not have been published. Mr Ivens has also apologised personally to the two women. News UK later clarified that the decision was an editorial one taken by the Sunday Times, not a corporate decision taken by its parent company. An apology will also be printed in next week's paper. The column, titled "Sorry, ladies - equal pay has to be earned", follows criticism of the BBC, after it was revealed two-thirds of its stars earning more than £150,000 are male. 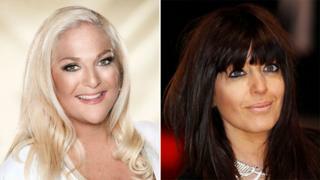 Commenting that two of the best-paid presenters, Winkleman and Feltz, were Jewish, Mr Myers wrote: "Good for them. "Jews are not generally noted for their insistence on selling their talent for the lowest possible price, which is the most useful measure there is of inveterate, lost-with-all-hands stupidity." In the article, Mr Myers also argued that male presenters may earn more because they "work harder, get sick less frequently and seldom get pregnant". The campaign said the removal of the article and apology from editors within hours was "proof that the decision to include the column was irrefutably wrong". The group - which had earlier called for Mr Myers' sacking - also said he should "no longer work as a journalist at any decent publication". Times readers - who must pay a subscription to access online content - commented on the original article to express their disgust, and called for both the writer and editor to resign. "The proud anti-Semitism in this column is nothing short of disgraceful. Myers must go and so must the editor who approved this piece," Alan Simpson wrote. "I think I have to cancel my subscription if the Sunday Times continues to employ this sexist anti-Semite. I hope lots of others do the same," another reader, Andrew Gilbert, said. Mr Ivens offered the paper's "sincere apology, both for the remarks and the error of judgement that led to publication". In 2009, Mr Myers wrote a column for the Irish Independent newspaper denying the Holocaust happened. It was removed following the criticism of his latest article.